As I climbed the steep, narrow, winding staircase of abandoned Mingus Union High School, a cool, but gentle, hand languidly brushed across my forehead. The hairs on my neck prickled, and my brows rose in wonder. I was not physically alone on the staircase, but neither was anyone within reach of me. The stairs brought me from the teachers’ dormitory to the main floor of the gymnasium where I stopped to consider what had just happened. The people ahead of me and behind continued upward without a care. Gooseflesh rose on my arms, as I recounted my ghostly encounter to the guide from Ghost Town Tours. Deadpan, he pointed out that the boys do love a pretty lady. In the 1920s, the building was constructed to serve as Jerome’s new hospital, but it became the center for education for mining families. Today, the deserted property registers electromagnetic energy instead of students with activity spikes recorded in the boys’ shower and the whiff of cigarette smoke present in the girls’ area. My mind was open to things that defied explanation, but I wasn’t a ghost hunter. A glance around present-day Jerome easily inspires imagination of the town it was during the mining boom of the early 20th century. Its history leaps from original buildings like the Jerome Grand Hotel, derelict mining sites or a worn, painted sign that reads House of Joy, reminiscent of a rampant prostitution business. 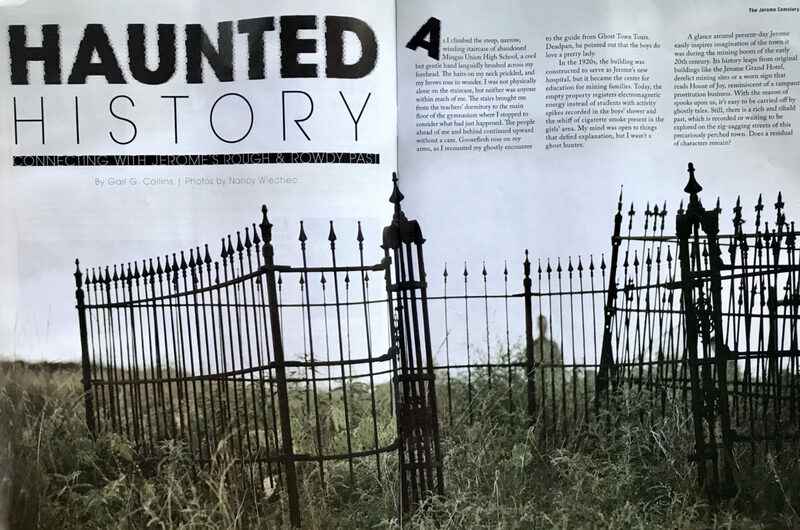 With the season of spooks upon us, it’s easy to be carried off by ghostly tales. Still, there is a rich and ribald past, which is recorded or waiting to be explored on the zig-zagging streets of this precariously perched town. Does a residual of characters remain? Originally, the Verde Valley was farmed by the Hohokam people, but Jerome has long been a place of mining. Whether it was those early tribes in search of ore for pigments, the Spanish conquistadors seeking gold or the two veins of copper that earned Arizona its nickname, the Copper State, the site suggested shiny value. In 1876, the first mining claims were staked on two mounds that later would be called Cleopatra Hill and Woodchute Mountain. The result of tectonic plates pushing an ancient, undersea volcanic caldera upwards revealed two of the wealthiest ore deposits ever found, worth more than $1 billion. The stakes were purchased a few years later and organized as the United Verde Copper Company and bankrolled by Eastern financiers, including Eugene Jerome. A small mining camp began on Cleopatra Hill and was dubbed Jerome to honor him. Eugene Jerome was a relative of Jennie Jerome, mother of Sir Winston Churchill. A few years later, the mine closed and was purchased by William A. Clark, whose successes in Montana mining carried over to assemble a profitable business venture in Jerome. He enlarged the smelter and built a narrow gauge railway. The company expanded to become the leading copper producer in the Arizona Territory, extricating nearly 33 million tons of copper along with zinc, lead, silver and gold.